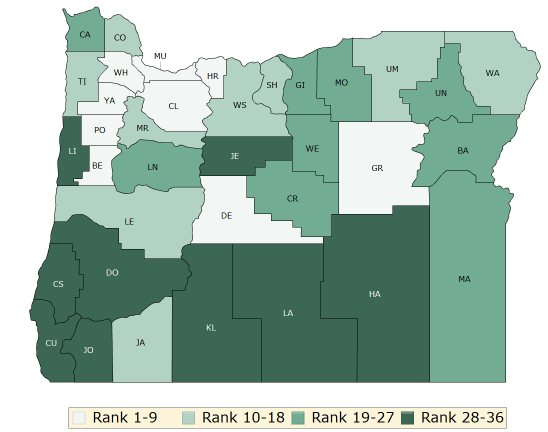 The 2018 Oregon Health Rankings Report reveals health disparities between counties across the state. The report evaluated all 36 of Oregon’s counties on a range of health outcomes and health factors. 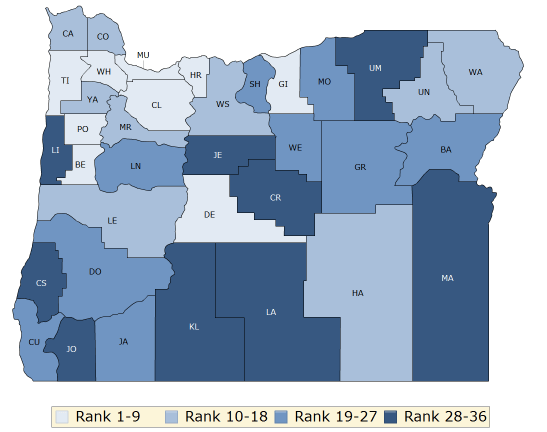 Top ranked counties for both measurements include Washington, Benton, and Clackamas counties. In general, the lowest ranked counties are clustered in the Southern part of the state and include Klamath, Coos, Josephine, and Jefferson counties. The report defines health outcomes as how long people live and how healthy they feel. To measure health outcomes, the report looked at premature deaths, measurements of newborn health, and self-reported health status. As a whole, Oregon ranks fairly close to the U.S. average for several health outcomes. However, there are wide disparities between counties. The number of adults reporting fair to poor health ranges from 10 percent in Clackamas County to 21 percent in Malheur County. The report also measures premature death rates based of the number of years of life lost before age 75 per 100,000 people. Washington County has a rate of 4,100 years while Curry County’s rate is more than double at 9,800 years. The report also evaluated health disparities in health outcomes based on race/ethnicity. Health factors are considered the behaviors and focus areas that influence health. For this report, health factors include a wide variety of measurements including access to care, social and economic factors, and health behaviors like smoking, physical activity, and diet. Similar to health outcomes, there are disparities in health factors between counties across the state. In Oregon, 17 percent of children live in poverty, which is below the US average of 20 percent. But based on county, childhood poverty ranges from 11 percent in Clackamas County to 40 percent in Wheeler. Another glaring disparity are the number of teen births per 1,000 which range from 7 in Benton to 51 in Malheur. The report also evaluated rates of sexually transmitted infections by measuring new cases of chlamydia. These rates are drastically different with 111.4 per 100,000 reported in Grant compared to 599.3 in Jefferson. To explore the data further, county comparisons for a variety of health outcomes and factors can be found here.